Malagos Chocolate is a Davao-based single-origin chocolate brand that’s been bagging awards all over the world for so many years now. And just last week in San Francisco, it’s been recognized by the experts at the Heirloom Cacao Preservation Fund (HCPF) in partnership with the FIne Chocolate Industry Association and the US Department of Agriculture. 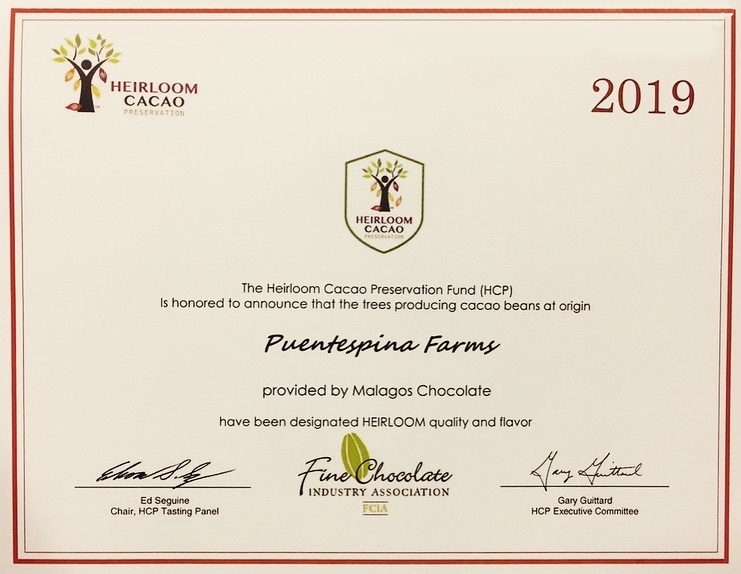 Puentespina Farms, the cacao source of Malagos Chocolate, has been certified as a home to high-quality Heirloom Cacao, a feat that’s hard to meet, last Jan. 12. It’s the 16th farm and producer from around the world to receive the designation (joining cacao farms in Bolivia, Ecuador, Costa Rica, and others) and it’s the first in the Philippines. “Heirloom cacao, the foundation of great chocolate, is considered the diamonds of cacao,” writes Malagos Chocolate in a Facebook post. The 24-hectare Puentespina Farms is located at the foothills of Mt. Talomo in Davao City. It’s been home to around 80 in-house farmers and cacao pods since 2003. The HCPF has certified that the trees and beans at Puentespina are of heirloom variety because of a combination of their historic, cultural, botanical, geographic, and flavor value.